Ever since Tim Ferriss popularized the use of virtual assistants (VA) in his book “The Four Hour Work Week”, (http://www.fourhourworkweek.com) dozens of firms and individuals have opened their doors to offer these services. I have experimented with several of these firms and have learned a lot in the process both about virtual assistants and myself. Let’s look at why you should think about using a virtual assistant, what kinds of tasks to outsource and how to manage the process. Identify early what you like to do (your passion) and the skills you have (your competence). Develop your skills in this area and don’t try to outsource it. It’s enormously empowering to take an important task and offload it to someone that you have confidence in. Outsourcing an important task to a trusted assistant allows you to kick-off the project that you have been muddling over in your head for months. By outsourcing the task it suddenly moves from the “I’ve been thinking about…” pile to the “Why haven’t you finished this for me” pile. We are great at procrastinating about our own tasks but suddenly very impatient about results once it’s assigned to someone else. So outsourcing is hugely empowering because it forces the project to move forward. That momentum is critical to getting things done. Once that forward inertia starts, it’s hard to stop. Outsourcing tasks/projects forces you to sharpen your focus on key aspects of the project. What’s the most critical item preventing the project from moving forward? It’s great to have been thinking about starting an online wine store but there are so many pieces to getting the business off the ground that you never do anything. Ask your VA to research competing online wine stores, hire another specialist to help design a logo and you are off and running. Now that you’ve invested a few dollars and have some momentum, you are much more likely to move forward on the project. Working with a Virtual Assistant forces you to organize your work. What exactly needs to be done? What are you trying to figure out? How best to go about it? Break the project into a bunch of small pieces and clearly define what’s expected, what completion will look like and when you expect it to be done. Hiring a VA might save you time but, for me, it’s really not about time but about leverage. It allows me to offload those 80% of tasks that are occupying my mind (and yes some of my time) and really get focused on the 20% of things that matter (and where i have real expertise). Most VA web sites suggest how fantastic their VAs are at freeing up your time by helping you buy birthday presents, make restaurant reservations and planning travel. If you are reading this, you are probably reasonably web savvy so you know that you can probably do these things faster than you can tell someone else to do them. Moreover, is offloading these simple tasks really helping you move forward on anything important or does it just allow you to procrastinate more about that online wine store. (I’ll have an upcoming post on how to get simple tasks done fast, free (or really cheap) and usually without a VA). 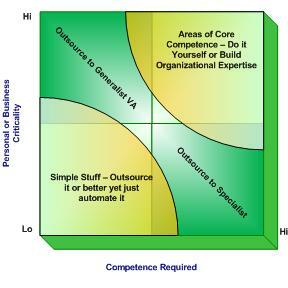 Below is a matrix to help you think about what things make sense to outsource and to some degree who to outsource to. Upper left: These are things that don’t require a lot of expertise to do so are good to outsource to a generalist VA. Pick things that will drive the business forward but not things that are make or break for the business. General market research, simple analysis of options, etc. I would be careful about outsourcing things that are too high on the “critcal” axis. I am not sure you want to outsource a decision about whether to be an LLC or an S Corp but you may want to have the VA do research on the pros and cons or process the paperwork. The same goes for critical personal things. For me, an anniversary present for my wife is pretty high on the critical axis and I would not outsource it — but that’s just me. The other set of things that can and should be outsourced are routine repetitive tasks. If you define these clearly and you can put up with training the VA, then you should be able to achieve reasonable results. A big caveat here though: if you can clearly define the process and it really does not vary then a little code, an excel macro or a database conversion tool will go a long way to make these kinds of tasks completely automatic. Lower right: Be aware that your generalist VA has limitations — probably more than you think. As you consider tasks that require increasing expertise, look toward you personal network, elance.com or odesk.com to find competent experts to hire. I have been shocked at how limited some VA firms are in the type work they will take on. Even things as simple as making some charts from an existing excel spreadsheet are completely beyond the capability of many VAs. Hire an expert and save yourself time and frustration. Upper right: This is the core of your business where you add value. Critical to you and requiring a high degree of competence. Keep these things in house, either do them yourself or hire a pro that you can interact with on a regular basis. It is possible to outsource some of these things but building a relationship and having good communication is critical. Apply the 80/20 rule to the simple stuff. Eliminate it or automate it but don’t waste your time or a VAs time trying to outsource it.